For the compote, melt the butter in a saucepan and add the onions and thyme. Stir over a high heat for 3–4 minutes so that they start to soften. Cover with a lid and turn the heat right down; cook for about 15 minutes. Uncover, turn the heat up and add the vinegar and redcurrant jelly. Stir for 1–2 minutes until jammy, then set aside. For the rarebit, place the butter and flour in a saucepan and cook over a low heat for 1 minute. Add the milk and stir until it's boiling. Stir in the cheese until melted. Grill the bread for 2–3 minutes until golden. Pour the sauce on top and grill for a further 1–2 minutes. 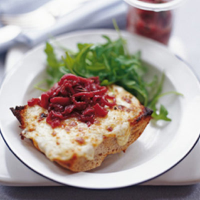 Serve with a blob of red onion compote.